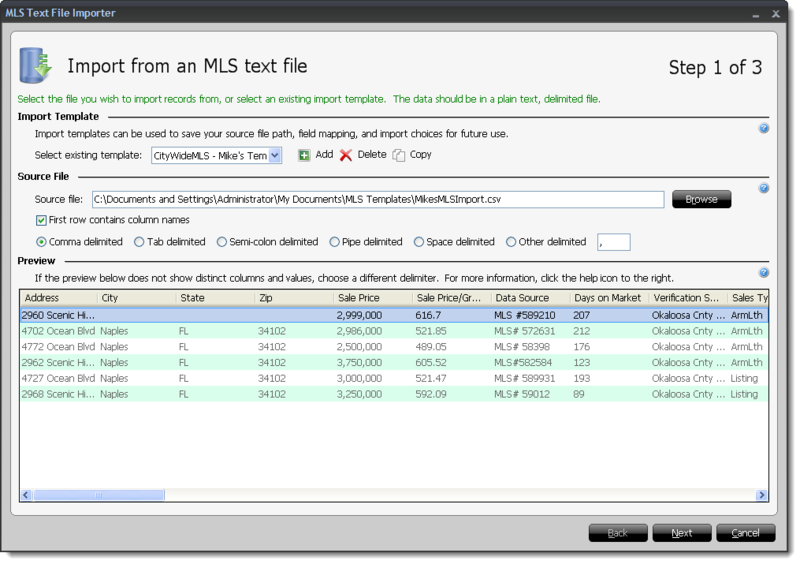 Export the property data from your MLS or other data source in a .CSV or .TXT file format. Open a report in TOTAL. Click Tools on the upper left, and select Import from MLS Text File… from the drop‑down menu. When the MLS Text File Importer appears, select a template you've set up previously from the Import Template drop‑down menu. If you don't have a template set up, click Add to create a new one. Once you have a template selected, click Browse near the upper right, and browse to the location of your MLS export file. Locate the file you want to use, select it, and click Open. If your MLS text file uses a delimeter other than comma delimited, choose the correct delimeter from the available options. Once the appropriate delimeter is selected, the various columns and data in your text file are displayed to show a preview of what will be imported. If the data doesn't line up with the correct column headers, or if special characters appear instead of data, this indicates an issue with the data in the text file, or a problem with how the file is formatted. Try selecting a different delimeter to corret the issue. Otherwise, you must manually format the data, or contact your data source for assistance with the export process. Once you have selected your source file and the delimeter, click Next to proceed to Step 2 of the MLS Text File Importer, and configure your field mapping.